Carol Danvers becomes one of the universe's most powerful heroes, Captain Marvel, when Earth is caught in the middle of a galactic war between two alien races. As mentioned in today's review, the Captain Marvel toyline features two Captains Marvel. While the one we gave the full review to had an aviator jacket (and an accessory and a part of the Kree Sentry BAF), this one is just her in her Kree battle suit. It honestly does do a fairly nice job of adapting her comic costume to the live-action style. (And side note: how much of the nakedly misogynistic hatred for this film online, do you think, is rooted in nerds' anger that Marvel changed her out of the black bathing suit in the first place?) 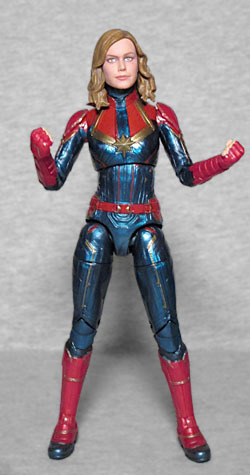 The suit keeps the classic red-and-blue look, with the gold star on the chest and the stripes running out to the shoulders from it, but manages to look more like armor than just a cool costume, thanks to the thin seams running all over the blue sections and the pads protecting the shoulders. The blue soles on her boots make it look like she's wearing old-fashioned gaiters, and she's traded her sash for a real belt. 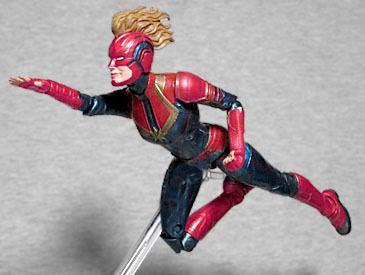 The figure includes alternate hands (either fists or flat, fingers-splayed hands) and two heads: one showing Carol's face, and the other with her helmet and mohawk. The likeness here looks much more like Brie Larson than the other version's Leslie Knope head, and the hair is longer and falls straight down instead of off to the side. And the one with the mohawk shows her smiling (which literally was one of the things the MRA idiots complained about - that she wasn't smiling enough for them. There is no limit to the depth of these morons' clueless stupidity.) The hair on the mohawk points back more than up; and of course, because this is a Hasbro figure and not Mattel, she can actually look up for a flying pose. This figure is strange. It's the "vanilla" version of the character, but doesn't include any part of the Build-A-Figure. Were the molds that expensive? And if we're not getting a BAF piece, why no energy effects for her hands? I tell ya, if this figure ends up appearing in a two-pack sometime in the near future, I'm gonna be mad I got her alone. At least you can swap parts around between this Carol and the other one. Marvel Legends Doc Ock addendum: sick burn! This entry was posted in blog exclusive review, commentary, Hasbro, Marvel and tagged Captain Marvel, Marvel Legends. Bookmark the permalink. That whole "why isn't she smiling" thing was stupid. As far as I remember, Mar-Vell was never one of those heroic, reassuring types like Superman or Captain America or All-Might, the kind of guys who'd sweep in and assure people that things are going to be okay, so having Carol Danvers be serious and unsmiling when she's in her Captain Marvel role felt okay to me, even right. I was actually really stoked to see how the costume department would translate the Captain Marvel costume into real life, and they didn't disappoint. I would've also liked to see how Mar-Vell would've looked in both his original Kree outfit and his upgraded outfit too, though. I imagine original Kree outfit Mar-Vell could've worked as an army-builder. If I may, my big issue with the Captain Marvel movie is swapping Mar-Vell's gender. All the stuff Brie Larson says while on PR tours? I deliberately went out of my way to not listen because I suspected it was likely blown out of proportion. The fact Captain Marvel is the hero of the film, and she's not in the bathing suit-like Ms Marvel costume? The heck? That was her Ms. Marvel outfit. This is her as Captain Marvel, the latest in the line of successors to the original Mar-Vell. She started out as a damsel Mar-Vell rescued, and now she was his successor! How awesome is that? But switching out Mar-Vell's gender... compared to stuff like casting Idris Elba as Heimdall (the director felt he was perfect for the role) or Michael Clarke Duncan as Kingpin in the Ben Affleck Daredevil (they couldn't find a white guy with both the appropriate bulk as well as acting chops for the role, so they went with a guy with both despite Kingpin traditionally being white), this felt more like making Johnny Storm a black guy in Josh Trank's Fantastic Four: an uneccessary change (especially since Trank made sure Sue Storm stayed white). I really wanted to avoid making the whole "oh, it's because they only want strong women in the movie, and all the men will either be stupid or evil!" argument, but because Marvel/Disney are really pushing the whole "she's an amazing female superhero!" I genuinely can't help but see switching Mar-Vell's gender as an attempt to make sure their 'strong female lead' wasn't influenced or inspired by a man. That's what frightens me. I originally did the same and avoided as many spoilers as I could, but hearing that one made me go, "Wait, hold on. This directly impacts my interest in the movie. I need to find out." It's apparently true, too, which is why my interest went from, "I have to see this on the first day!" to, "Maybe I'll wait till reviews come out. I don't care how much people rave about how good it is, I really only wanted to see Captain Marvel because I wanted to see how Mar-Vell gets treated." The thing with the Ancient One was that "the Ancient One" was always a title, as far as I know. Like you said, the Ancient One wasn't so much a character as a set piece to set Dr Strange on his journey. Maybe the one we knew from the comics died earlier, and the one we met in the movie was his successor. That's okay. That's actually what I thought would happen in Captain Marvel, that there'd be reference to a deceased hero named Mar-Vell and that somehow Carol would be inspired to take up his name. Or maybe there'd be a female Captain Mar-Vell, but she'd mention she took up the name of a fallen predecessor (the way in comics you had quite a few Captain Marvels before Carol Danvers, including the African-American heroine Monica Rambeau). If all the movie crew did was swap the gender, that's just, for want of a better word, lazy. But I hope you see why for some people the whole pushing of Carol Danvers being a 'strong female hero' came at the cost of a perfectly respectable male character. Marv had a long history before he died. He took part in some epic battles, especially against Thanos. To just have him wiped away and replaced with a female version simply to have Carol inspired by a woman as opposed to a man... it just leaves a bitter taste in my mouth, especially since Mar-Vell means a lot to me. But hey, if I'm wrong and it turns out that there is a Female Mar-Vell and she's a legacy character, or Original Mar-Vell is in the movie, then I'll happily come back and admit I was totally wrong. I finally got round to watching the movie, and while I thought the movie itself was perfectly serviceable, I walked away convinced that changing Mar-Vell's gender was totally unnecessary. There just wasn't anything in the movie that suggested that Mar-Vell absolutely had to be a woman, except for the out-of-universe "our Captain Marvel has to be inspired by another woman!" subtext. Well, yes and no. There might not have been any reason the character needed to be a woman, but that also means there was also no reason the character needed to be a man. Mar-Vell may have had his own adventures in the '70s, but as far as Carol's story goes, he's a plot device, not a character. Your feelings are totally valid, as a fan of those old books, but if there were THAT many people who were into Marv, his biggest contribution to the Marvel U wouldn't be "getting cancer." It's not really that Movie Carol "has to" be inspired by a woman, she just has to be inspired by SOMEBODY - and there isn't really any good reason to say it can't be a woman.